So, what is this thing? Good question. Think of it as a softcover portfolio book of fine art photography, paired with stories and essays about National Parks, the outdoors, and today's photography culture. I'm calling it a "Zine" or "Photographic Journal" in an effort to help photography enthusiasts and collectors understand it. Zines are small self-published booklets created by independent authors and artists to get their work into the world without having to deal with a large publishing company. Photographic Journals are a magazine-type publication containing projects, or series of images around a central theme, paired with editorial writing around that theme. I took inspiration from books, zines, and journals and created something that is larger and much higher quality than most Zines, much more affordable than most photography portfolio books, and self-published, unlike many photographic journals. To add to the uniqueness of the publication, all the images are created on large format sheet film, the traditional medium used by photographic artists such as Ansel Adams and Edward Weston, using a new version of their traditional wooden view cameras. This medium amazingly still out-resolves even the best digital cameras of today for detail, while providing a more aesthetically pleasing and natural color rendition as well in my opinion. I also enjoy the process, which encourages a slow, intentional creative flow. This exciting new issue features a project exploring seasonal change in the stunningly beautiful Zion National Park in Utah, in the southwestern United States. The entire project is in color. For this stage of the project, I wanted to focus on autumn and winter, especially on the incredible diversity of the multicolored leaves in the fall, and the serene and pristine beauty of fresh snowfall in the winter. The images have been carefully curated and the essays and stories inside thoughtfully authored and edited over a period of several months, and I couldn't be happier or more excited to finally be able to share the results of all this hard work with you, my supporters! To those of you who purchased Issue One, Mojave Monochrome, thank you! Your support means the world to me. To those of you who haven't yet had the ability to order your copy, it is still available here, and makes for an excellent complement to this second issue. When it came time to create the next issue of Salt & Light, I looked long and hard at what I'd built with the previous issue, and how I could improve upon it. In terms of written content, this new issue contains several essays and stories about my trips to and experiences in Zion National Park, thoughts on artistic philosophy, fine art photography, and social media. I talk about the current state of social media, where fine art photography finds itself today in this ephemeral world, and how we as artists can and do relate to it. I discuss the how and the why of the way I do photography today, and also some of my thoughts and feelings surrounding Zion National Park. If you enjoy the images, all of the images featured in this issue are also available right here for purchase as fine art prints. If you have any questions about ordering prints or about photography - mine, yours, or just in general - don't hesitate to email, call, text, or send me a message on Facebook or Instagram. I'll be happy to help! When my wife Erica and I discussed coming up with a new photography publication, we looked at a lot of zines from other photographers and came to the conclusion that we wanted to offer something different from what we saw on the market. The majority of self-published zines seem to be primarily a photographic portfolio, with all the emphasis being on images and captions, but without any editorial text content. While this is an excellent and very enjoyable format, for me personally as an artist, I feel that my writing is the element that allows you to get to know me, join me on my adventures, and see behind the lens. We decided to make this a true "journal" in that it strikes a balance between photography and writing. Every other page is either a full page image or a full page of text, and in this way, the journal has a nice rhythm and flow to it. This issue takes what we created in the first issue, and builds upon it to try and explore this concept further. We hope you enjoy every page! The images were very carefully curated from a larger body of work, and represent the current best of my ongoing Zion's Palette Project, which is a photographic exploration of the seasonal changes in Zion National Park. We picked the number of images we did because we wanted to force constraint in order to ensure quality. The stories and essays inside were thoughtfully authored over a period of several months and edited numerous times, going through repeated drafts in an effort to best convey my thoughts and feelings to you, the beloved reader. In an era where seemingly everything is digital and created for the immediate, we wanted to craft something physical that is affordable, yet designed to last. We hope that these beautiful and carefully crafted journals will find a permanent place on your coffee table, nightstand or bookshelf and bring beauty and inspiration into your life whenever you look at them for years to come. The journal is printed on a thick premium velvet matte paper to ensure optimal print quality and longevity. We put a great deal of work into the graphic design and typography of the journal as well, as I have an extensive background in this field and wanted to this publication to stand out in a sea of other zines as one of the best. It is our hope that you will enjoy reading and viewing it as much as we enjoyed creating it for you. The journal costs just $14.99 per issue. 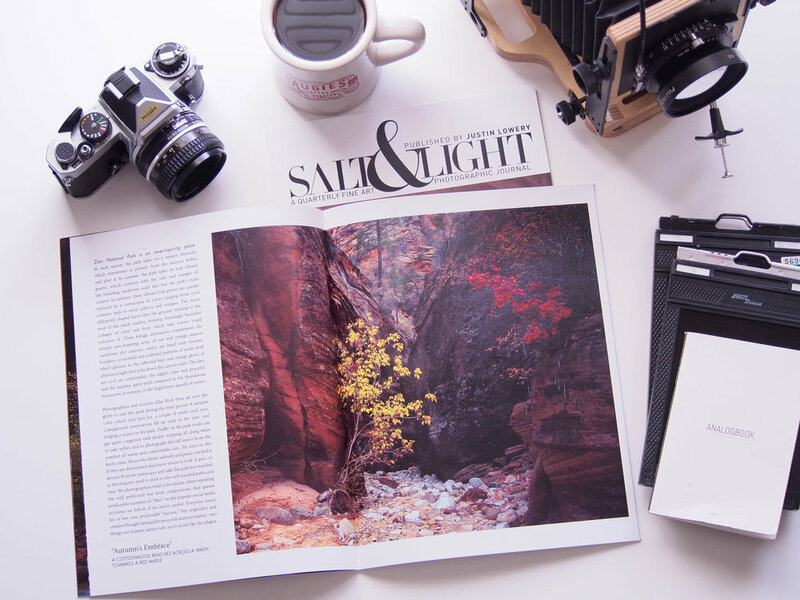 You can also purchase the electronic version of “Salt & Light” to read on your iPad, tablet, computer, and smartphone for just $7.99. Order the Print Edition of Issue Two! Or, Get the eBook Edition Here.